Limited Parking at Church. Please see alternate parking information below! Parking: There is very limited parking available at the church. Please do not park in the yellow lined spaces in the church car park as parking tickets may be issued. Alternative Parking: Council car park at Millmead (5 mins walk); Council car park at Millbrook (10 mins walk via the lock by the Yvonne Arnoud Theatre); Artington Park & Ride (the bus stops opposite the church). Public transport: Closest station is Guildford. From the station (main exit) turn right, cross the pedestrian crossing heading for St Nicholas Church (not the Shops). Carry on up the hill to Godalming. The Church is 300 yards up from St Nicholas Church. Guildford United Reformed Church has been meeting at various buildings around Guildford since the 17th century. 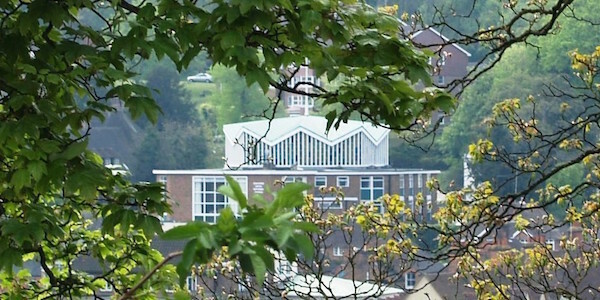 The church moved to its current location on the road out of town in 1965 when the architects Barber, Bundy & Greenfield designed this startlingly modern octagonal building to replace the former premises in the town centre. The church is light and spacious, beautifully lit through the windows high above in the clerestory, and is home to an impressive church organ that is said to be one of the finest in southern England. 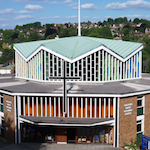 Music is at the heart of the community life of the church, and the excellent acoustics create the perfect spot in which to enjoy one of the frequent concerts that take place there. 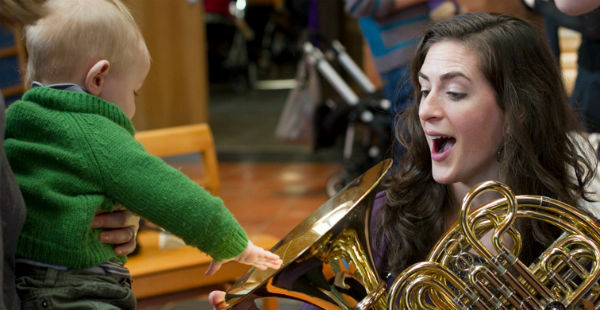 Bach to Baby is delighted to now be part of this thriving musical scene!